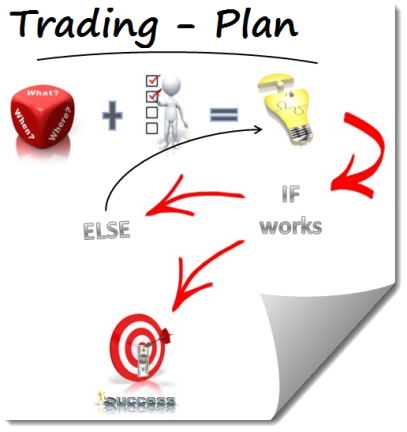 Your Trading Plan should be used as a guide for the type of information that you may wish to include in your own detailed trading plan. However, each of the following sections should be addressed in some form. A trading plan can be as simple or as complex as you want (or need) it to be. Of course, if it’s too simple, you may not have enough information to successfully implement key points, rules (and/or) strategies during each trading session. Conversely, if it’s too complex, you may find it hard to adhere to and forego using it altogether. The main point of a trading plan is to keep you calm and relaxed during a trade, as all thinking should have been done prior to your entry – not during your trade. Professional traders are relaxed and composed when trading. Amateurs are nervous before the trade and reckless during the trade. Keep your trading plan dynamic! Modify it (only) when your experience and knowledge of the markets (grows), and your trading activities & data analysis tell you to do so… never during a trade or trading session! Once your trading plan is complete, you’ll find that trading will become more objective, you will be less emotional, and your trades will be more selective. It will add structure and organization to each trading session. It will be your ally when dealing with unexpected moves in the market, rather than making unjustified decisions when a trade does not go as expected. 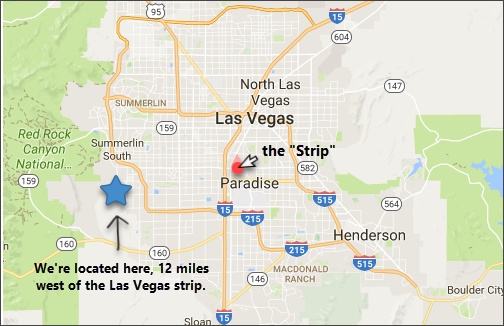 This is an “example”, used for illustration purposes only. Please take any ideas that you feel are a good fit for your own trading business, but know that each traders ‘plan’ should be unique and individualized based on their own future goals and past experiences. I recognize that Trading is one of the most challenging and rewarding professions on earth. I welcome the challenge, and through: education, consistency & persistence, a specific trading plan, proper mindset and the right tools, I will overcome the challenges and succeed and prosper in the financial trading arena. This will allow me to govern my own path and destiny without having to rely on anyone else for my well-being. My beginning approach is to take advantage of short-term trends in the Equity market, while using the daily (chart) time-frame to scan for potential “Swing” trades that will be held for one to a few days, possibly weeks or until the trend has ended or my target objective has been reached. Once I find consistency in this less frequent time-frame, I will seek to duplicate my success on the more frequent intraday time-frames. Monthly – To never let a ‘planned’ opportunity pass. To follow my trading plan without reservation. To hit “singles & doubles”, knowing that “home-runs” will come over time. Above all else, I will be consistent! Yearly – To steadily increase my risk amount when my data tells me it is advisable to do so. To continue learning through my day-to-day activities of being in the market and through continued education. To keep trading business expenses to a minimum. To see a steadily rising equity curve! Long Term – To trade for life! I would like to have multiple accounts; One for Income, via Day trading and one for Wealth, via Swing trading. This will allow me to eventually build up a retirement account where I can trade within a Roth 401K Plan. Being a trend-trader, I will seek to attain no less than a 50% win percentage, with an overall Profit Ratio of no less than 1.5. My focus will remain on the Equity markets, but I will look to duplicate successes in other market arenas when my time allows for greater trade frequency. Daily setups (only) during my initial trading phase. I will scan for the following two “trend” setups: 1) Basing/Breakout near 20ma, 2) Pullback to Minor Support or a rising 20ma. All orders will be limit orders at the Ask price once a trade confirmation has been achieved. If my full share lot was not executed, I will seek to add liquidity by buying the remaining shares at the currently displayed bid price. My stop-loss prices will always be determined prior to entry, and will be at logical major-pivot locations on the chart that I’m trading from. Half profit will be taken nearing a predetermined point of support/resistance, which must represent a 2:1 reward/risk ratio. Final profits will be taken after a confirmation of the end of the current trend (from chart of entry), unless ultimate target has been achieved first. My trade risk (1R) will be 1% of current (daily adjusted) trading capital. I will not have more than 4R at risk at any one time. Log in to trading platform. Review index charts for short-term bias. Use my chosen finance website to review earnings reports, and then log into Trade Ideas scanner for new trade opportunities. Load potential trades into Long and Short watch lists. Set alerts near entry points. Update TJS Journal. 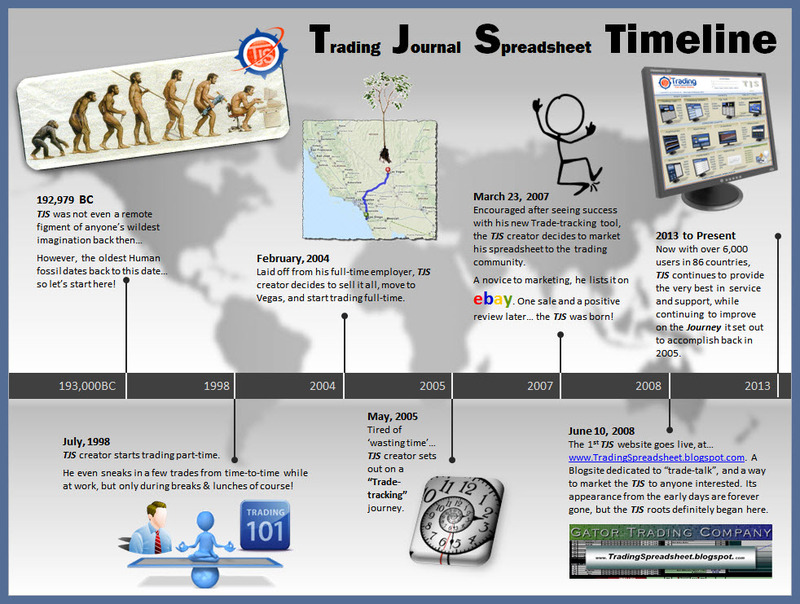 Take screenshots of closed trades and hyperlink to its corresponding trade journal entry. Review all open trades for possible next day action. Review any closed trades to determine whether plan was followed (or not). Mark up SPY and Q’s chart for next day bias. Clean-up trading platform. Review the notes and screenshots of each trade 5-8 days after closure and after all biases and emotions have subsided. Write notes in the journal sections of the TJS as to how future trade executions, management and exits can be improved. 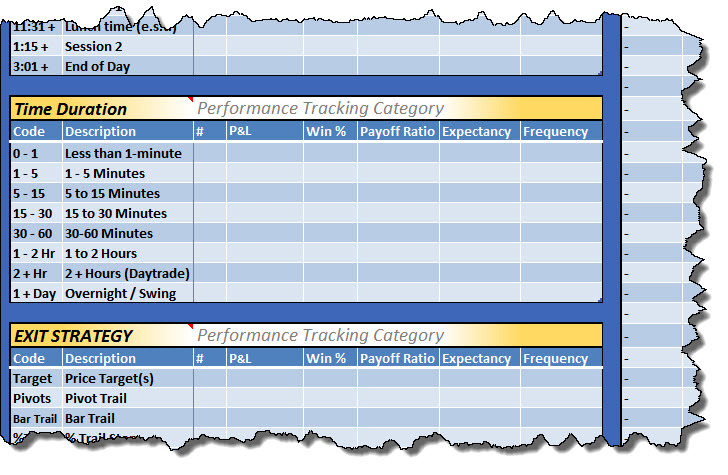 Bi-weekly, check TJS Analysis sheet to see what sub-categories are producing positive expectancy (with frequency). Modify ‘plan’ according to updated information. Read one new trading book a month from my selected group of trading (mentors / authors). Attend two seminars / conferences a year when/if my chosen trading (mentors / authors / educators) will be teaching or broadcasting. I will abide by the (5) Fundamental Truths & “Trader” Mindset, from author Mark Douglas of “Trading in the Zone”. I don’t need to know what is going to happen next in order to make money. There is a random distribution between wins & losses for any given variable that defines an edge. Be disciplined every day, and in every trade. I will be my own trading “self”, never trading another’s plan. I love taking small losses. I’ll always earn the right to trade bigger. I am not addicted to trading just to see what happens. I only trade high reward setups that have the probabilities in their favor. Be a bricklayer – make the same type of trades over and over again. Once I find a setup, I do not hesitate; once in a trade, I do not over analyze. A detailed Trading Journal will be kept at all times, and I will act upon what it tells me. Everything I do will be for the success of my business!!! This is a living document . . . It may change as my experience increases, (and/or) my knowledge of the markets increase. this is a Microsoft Word template. 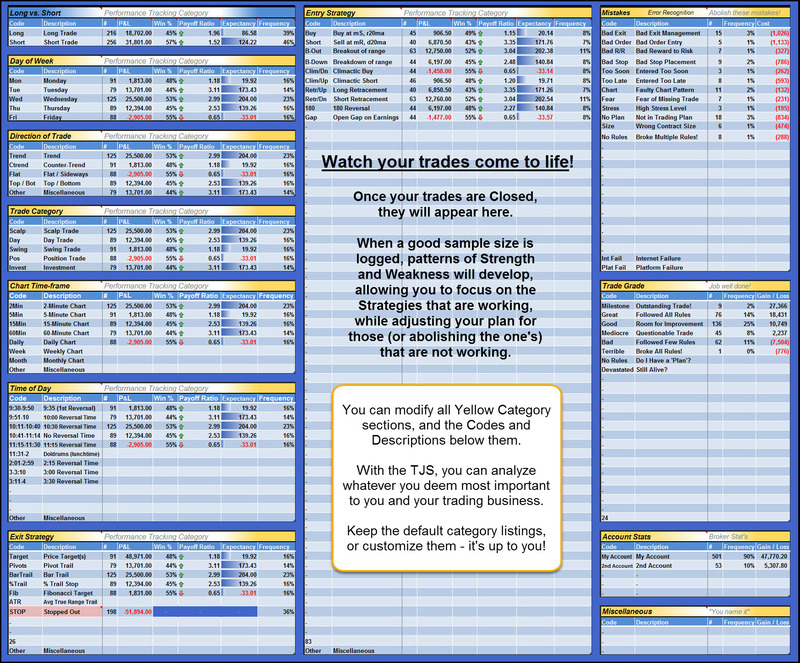 Need an expert Trading Journal?